How do children acquire language? As Susan H. Foster-Cohen put it in her book An Introduction to Child Language Development , most parents would reply either that they taught their children how to speak or that their children learned language “from hearing it and from being spoken to” (Foster-Cohen 1999: 95). This statement brings along further questions: Are children really dependent on input from their environment? If they are, when do they need to get what amount of input? And, more specifically, what sort of input do they need? There is a huge amount of different theories regarding children’s first language acquisition and the most important ones will be depicted in my term paper. At first, we will get a general overview on the different phases or stages a child goes through during language acquisition. Then, we will see some strange or “secret” phenomena, which bring along the question whether children only learn language by imitation as stated above by several parents, or if there might be an innate knowledge about how language could look like. 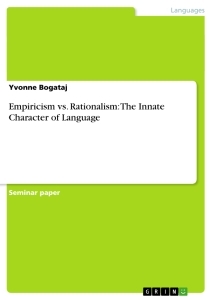 We will then differentiate between the empiricist and rationalist positions that were represented by Locke and Descartes in the 17th/18th century. These positions have been examined and developed since then and will lead us to take a closer look at more modern theories. Piaget’s constructivist theory as well as Chomsky’s innateness hypothesis will be depicted and discussed in my term paper. Finally, we will see an example that demonstrates the important problem of the time limit for language acquisition. We will finally discuss whether this problem is contradictory to Chomsky’s innateness hypothesis. Researchers agree that a child goes through certain stages during the production of speech and that these are organized in a hierarchical structure; i. e. each stage incorporates the one before and builds upon it. Of course, the boundaries are not precise, because some children are linguistically more advanced than others. Before we take a closer look at the different stages, we have to note that this categorization can certainly not be valid for children that suffer from severe mental or physical defects. Deaf children of hearing parents, for example, cannot hear their parent’s language and therefore are not able to imitate their speech as physically healthy children do. They have to learn to communicate via sign language, which is a totally different field that cannot be discussed here, because this would exceed the page-limit of this term paper. From birth on, children make noises like crying, burping, and sucking. These are known as vegetative sounds (Harley 2001: 91). Although these are not yet real speech sounds, by producing these, children learn to coordinate breathing with sound production (Steinberg 1993: 4). Around two months of age, children start cooing and, later, also laughing. These sounds are called comfort sounds [Int1]. Between four and six months of age, children start to produce “speech-like sounds. Vowels emerge before consonants” (Harley 2001: 91). This stage is regarded as vocal play . Next, approximately between six and nine months, children start babbling. “Babbling is a type of vocalization where the child uses speech sounds, mainly vowels and consonant-vowel syllables, e.g. ‘a’, ‘u’, ‘ma’, ‘gi’, ‘pa’ “(Steinberg 1993: 4). These sounds are often repeated in their utterances, e.g. ‘mama’. However, these sounds cannot be regarded as true words, because there is not yet any meaning connected to them. From eight to ten months of age, children show the “first signs of word comprehension” [Int1]; i.e. they start to understand how certain situations and sound strings are linked together. Around the age of ten months, children produce their first words (Harley 2001: 91). The resulting one-word utterances occur between ten and 18 months. They are basically used to name objects. Later, children also try to articulate more complex thoughts by applying them. This phenomenon is often referred to as “holophrastic speech” [Int1]. At about 18 months of age, children’s vocabulary usually increases considerably. Harley points out that children may learn around 40 new words per week (Harley 2001: 91). At the same time, the first two-word utterances occur. They are mainly used to express “semantic relations, e.g. Agent-Action: Daddy run” [Int1]. However, a child is generally not able to produce full sentences until the age of two years and six months. Previously, they produce so-called telegraphic speech ; i.e. combinations of three and more words with only few grammatical elements. These utterances may sound like “Milk all gone” [Int1]. As we can see in this example, the determiner and the correct verb form are still absent. The correct sentence would, of course, be: The milk is all gone . Between 24 and 30 months of age, children acquire the use of “inflectional and functional elements”, this phase is called “morphosyntactic burst” [Int1]. Afterwards, at the age of three years, children’s utterances become longer and more complex. This development continues throughout childhood. In fact, “we never stop learning new words. It has been estimated that the average young teenager is still learning over 10 words a day” (Harley 2001: 91). In this paragraph, we are shown some “secret” or strange phenomena that children show during their language acquisition process. These phenomena are considered to be universal; i.e. they do not occur in the first language acquisition of the English language only. attend particularly to shape and give evidence of forming object categories very early: they respond selectively to novel instances of schematic drawings, for example, distinguishing members from non-members for a category previously learnt (Clark 1993: 44). They continually respond to objects surrounding them, so it seems probable that they have built up several categories of objects before they start to produce their first words (Clark 1993: 44). Not only are they eager to touch objects, they are soon also able to sort them into groups according to their shape. This aptitude reveals that the shape of objects is probably the most important criterion for children to figure out which object is a member of a certain category. That can also be seen in children’s overextensions of words, which will be described in the following section. We have seen in paragraph 2.1 that children produce their first true words from about one year of age onwards. Furthermore, we found out that at about 18 months of age, children’s vocabulary increases considerably. In this period, overextensions are quite common. They appear to be found across all languages. An overextension occurs “when a child uses a word in a broader way than the adult usage” (Harley 2001: 113). The child extends the area which the word he or she uses refers to, e.g. the word doggie is used not only to refer to dogs, but to every animal with a similar shape, including cats and foxes, for instance. since they do not yet have words for many of the objects that resemble dogs in appearance, they continue to over-extend doggie to point something out or to make a request. They stretch their meager vocabulary to its limits in their attempts to communicate (Clark and Clark 1977: 497). This also explains why, with the growth of the child’s vocabulary, overextensions occur more rarely and finally disappear. By the way, there is also the reverse phenomenon, which is called underextension . Underextensions occur when a child uses a word that represents a more restricted category than in the adult usage; e.g. to use the word flower to refer only to roses, although the child is also familiar with other kinds of flowers. The question remains why children place objects into certain categories according to features like size, shape, smell, noise, etc. Nobody told them to do so, thus it must be processed somehow instinctively. Henry James. A Fictional Character in Colm Toíbìn's "The Master"? Chomsky’s Modularity Hypothesis – Is There an Innate Language Module? Character Design. Umsetzung, Methoden und Mechanismen.